We wanted to give a shot out to a couple events that some friends are hosting this week! With all of the attention given to SB1070, and the inspiring resistance that manifested, it's good to showcase some of the other projects of resistance coming up in our city and state. 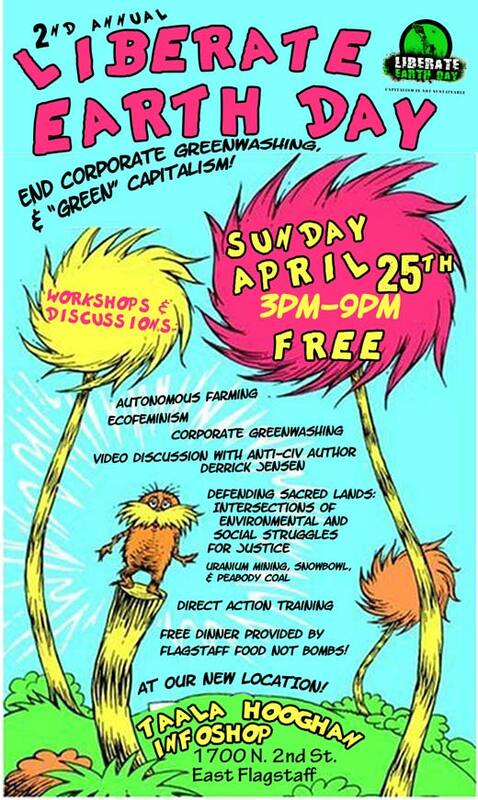 Tomorrow, our friends in Flagstaff at the Taala Hooghan Infoshop are hosting the second annual "Liberate Earth Day: End Corporate Greenwashing & “Green” Capitalism." Coming with a perspective that both shuns the false alternative offered by the reform based environmental groups (non-profit industrial complex), and orients the struggle against ecological destruction on anti-colonial and anti-capitalist terms! Below is the schedule for tomorrow! 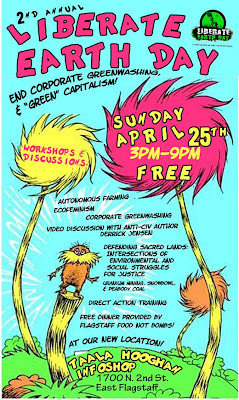 "The Taala Hooghan Infoshop & Youth Media Arts Center is very excited to present our 2nd Annual Liberate Earth Day Event for an end to corporate greenwashing & “green” capitalism. An anti-capitalist/anti-colonial event for healthy and sustainable communities! Second Annual LIBERATE EARTH DAY! End Corporate Greenwashing & “Green” Capitalism! • Direct Action: Tactical training and discussion Free food by Flagstaff Food Not Bombs"
Click here for a full schedule and description of workshops. Some comrades in Phoenix have organized an anti-police event this Friday in downtown, this event will be a great opportunity for anarchists and anti-authoritarians to gather and create the possibilities for a world without police. Come meet other members of the community to discuss alternatives to using police as a means to conflict resolution. Learn about successful alternative models already established around the United States as well as reasons why relying on armed strangers rather than neighbors or friends only increases the possibility for unnecessary violence to occur. Every day laws are being passed that legitimatize the police as the armed enforcers to racist policies. Every year at least 600 people are killed by on duty police officers, with Arizona being the state with the 3rd highest rate of unarmed suspects being murdered by police. By creating safe autonomous communities, it is possible to prevent these murders by making the current police system obsolete. PHOENIX CLASS WAR COUNCIL is a fanatical, revolutionary anarchist group pressing the attack against capitalism, the state and all systems of hierarchy and oppression. We fight for a self-determined, projectual life for ourselves and all humanity. 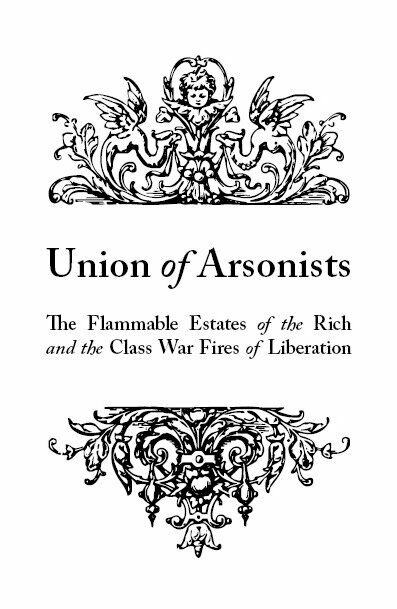 We oppose those who hinder working class self-organization. We are libertarian and libertine. We support movements but we don't wait for them. We are in the thick of it. Get in touch. Get our stuff. Videos: Check out our youtube channel! Get a pdf of the most recent issue of our paper by clicking here. So what if all the colleges burn down? All Power to the Positive! Resistance to SB1070 that you may have missed.